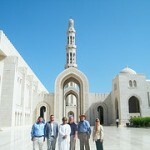 We started out our tour this morning with a visit to the Grand Mosque in Muscat, Oman. The Mosque is truly a wonder – with a total capacity of 20,000 worshipers. The marble, tile work, the world’s second largest Persian rug, and chandeliers are a beautiful site. In the spirit of cooperation and inclusiveness the Mosque was designed and built by workers from all over the world and overseen by the Sultan of Oman himself. After the tour we received an historical lecture on the geography, cultural and social life of Oman from Dr. Ahmed Ali M. Al-Mukhaini at the civil society organization Tawasul, an independent, private think tank that promotes effective and efficient civil society in Oman. In the afternoon we discussed labor laws and the recent workers strikes in Oman for higher wages and other demands with the Muscat American Business Council. The recent right to labor organization’s in the state and the right to organize granted by the state have led the people to the streets to address what Omani workers see as grievences against the private and government sectors. In the last three weeks there have been over 100 protests for a variety of worker’s rights. The delegation and the Business Council discussed the need for understanding and dialogue between the workers and the companies so that a solution could be met that benefits both worker’s rights and economic growth for Oman. Members of the Council include representatives from private industry in other countries doing business in Oman. The next stop was a discussion held with one of the first community service organization’s in Oman – Environmental Society of Oman. We discussed current Omani environmental issues from the preservation of native Omani vegetation to the research of whales and dolphins unique to the Arabian Sea. Dr. Mehdi Ahmed Jaaffar, gave a lecture on the development of civil society organizations and the roles of volunteerism in the region. I was happy to discuss the work of the Corporation for National and Community Service (www.NationalService.gov) and our role in promoting volunteerism, service and citizen participation as a way to address a nation’s most pressing issues. To cap off the day we spent a lovely evening on with the Sidab Women’s Sewing Group – a collective of women in Sidab, Oman – a small fishing village near Muscat. Run by volunteers with corporate support and funds they raise from selling handmade crafts – the women’s collective teaches skills such as photography, English language and computer skills. They have several micro-enterprise businesses that employ women in the region and promote Oman culture through their handmade crafts and other items. 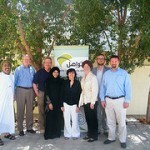 This organization shows civil society and volunteerism – with a touch of entrepreneurship is alive and well in Oman.